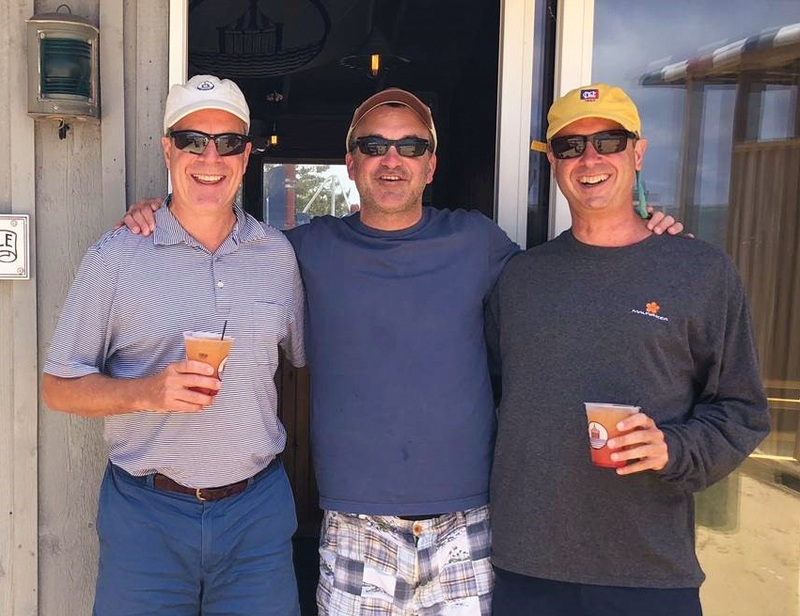 Formmates from 1980 (l. to r.) Mason Wells, Andrew Greenebaum, and Richard Walsh at Chappaquiddick Beach Club on Martha’s Vineyard. Maddox Angerhofer ’18 (second from left), daughter of Melissa Solomon ’80, served as coxswain for the Form of 1978 boat at Anniversary 2018. Geoffrey Underwood ’80 in Germany, watching his daughter run the 45th BMW Berlin Marathon. Reza Dana was awarded a Research to Prevent Blindness (RPB) Stein Innovation Award in June, one of just 11 researchers nationwide to receive the award. He was also presented with the Friedenwald Award by the Association for Research in Vision and Ophthalmology (ARVO), an accolade presented annually to recognize outstanding research in the basic or clinical sciences as applied to ophthalmology. Chase Robinson was named director of the Freer Gallery of Art and the Arthur M. Sackler Gallery at the Smithsonian Institution. Before the move to the Smithsonian, Chase was president of the Graduate Center of the City University of New York and a professor of Middle Eastern history and culture. Carl Weatherley-White ’81 (l.) and Peter Paine ’81 looking distinguished in Locust Valley, N.Y.
Reza Dana ’81 in Barcelona, after receiving the Academia Internationalis medal in June. Fiona Sanders ’83 (l.) and Denise Goodman ’83 were reunited this summer through a mutual friend’s Facebook post. I know I join many in our form in thanking Michael Stubbs for leading the charge and creating a spectacular 35th reunion weekend. In addition, a big shout out to Tod Brainard for doing a stellar job at raising money in honor of our school and our form. Personally, I loved catching up with so many and enjoyed our day on our beautiful campus parading (Old Guys Rule!) and our night at the Boathouse. It was a busy summer for me with our three college boys back in the house and working and our 12-year-old daughter deciding that sleep-away camp was not for her. I continue to write for a local paper and I am involved in a few of the kids’ schools and some local organizations. I am looking forward to reconnecting with you and with our school. I was devastated at the passing of Bettina Unhoch Pike. As one classmate described her, Bettina was a force of nature. She was a wonderful friend and mother, funny and strong and warm, and she will be missed. A note from Winter Mead: “After more than 25 years in California, my wife and I have escaped the traffic, fires, and high standard of living to move to Columbus to help take care of her elderly parents. Although the shift has been a bit of a shock (evidently I’d forgotten what humidity is), we’re adjusting and – with OSU and the state capital – we’re finding it more progressive and “foodie” than Ohio’s two smaller cities: Cleveland and Cincinnati. That being said, we still plan to do everything in our power working on the campaigns this fall. The other consolation of this move is that we were able to visit with my old roomie from Nash, Nat McCormick, and his wonderful wife, Jenny. We had a terrific time catching up with them as they got ready to send their older daughter off to college. We are looking forward to being nearer to them and other friends in Eastern Standard Time, as well as hoping to reconnect with another old roomie, Edward George, Esq. A Facebook post recently reconnected Fiona Sanders and Denise Goodman via a mutual friend. Come to find out they’e both been in the same church for more than 20 years in various states. Since June, they’ve caught up in Connecticut and Rhode Island, and are looking forward to a dinner reunion in New Jersey with Rodney Bolden this fall. SAVE THE DATE! We’ll be celebrating our 35th Anniversary on Friday, May 31, and Saturday, June 1, 2019. I know already that the highlight will be our party at the Boathouse on Saturday night. I went in June to the Form of 1983’s at the Boathouse and it was a blast. It’s not too early to register on our form’s page at www.sps.edu/1984. Looking forward to a great turnout from the form for the weekend. Stephan Achenbach continues to enjoy working as a cardiologist at the University of Erlangen, Germany, and has just been elected as the president of the European Society of Cardiology for the term 2020-22, representing 95,000 members from all across Europe and the Mediterranean. Fact: Lida Lee “Leelee” (Lloyd) “Shazam” Treadwell still has the hugest and most kaleidoscopically dazzling blue eyes on the planet. How do I know this? Here’s how: In late August, Leelee and her two brilliant, Exeter-attending daughters, Francie and Cecilia (dynamos! both of ‘em! ), visited me at my little hobbit cottage here on the grounds of the National Cathedral in D.C. (Francie’s a senior interested in a few D.C.-area colleges.) We sipped iced tea in the Bishop’s Garden; it was righteously twee, and I loved it. Nick Hutchinson still lives with his family in Denver, where he continues to write about music for the local alternative newsweekly, Westword. He plays with his band on occasion and always enjoys seeing fellow Paulies. He had a blast attending Dead & Company in Boulder this summer with Mary Robins ’84, Maja Paumgarten ’84, Posey Saunders ’84, Chris Chappell ’84, Eric Sorensen ’84, Dave Ingalls ’84, and Chris Wirth ’86. Nicole ’85 and Garry Channing ’85 spent time with formmate Don Sung (r.) in Croton-on-Hudson, N.Y.
Kevin and Annie Jacobsen ’85, celebrating 22 years of marriage. Juliet Hochman ’85 competing in the half-Ironman triathlon in Whistler, B.C., and receiving real-time race intel from son Thomas. (L. to r.) Megan Murphree (fiancée of Lance Khazei ’85), Jim Frates ’85, Beth Frates, and Lance in Edgartown, Mass. (L. to r.) back: John Greene ’85, Carder Stout ’87, Julie Stout ’95, Jamie Young ’85, Court Fawcett ’85, Matt Warren ’87, John Trevor ’85; front: Jennie Jones Stout ’95, Bart Quillen ’85, David Foulke ’85, and Nate Downey ’85 gathered in Brookfield, Mass., to honor deceased schoolmate Craig Stout ’85. Nick Stevens ’85 was also present. (L. to r.) Richard Baldwin ’85, Sandy Osborne ’89, Daphne Garrett ’22, Lew Nash ’85, Jack Rusher ’85, Rob Garrett ’85, Holly Sanderson Garrett ’87, Johnsie Garrett ’87, Melanie Shaw MacMillan ’87, and Peter Paine ’81 at the wedding of Rob and Holly. Members of the Form of 1988 celebrating during Anniversary Weekend 2018. I am still enjoying the memories of June Anniversary – it was so much fun to see everyone. Fall is here now and I just dropped off my girls at SPS. The Form of 1988 now has nine children in attendance at SPS (and two more who have graduated). I will hope to continue to see fellow ’88 alumni/SPS parents Alison Cody, Blair Enders, Christine Pillsbury, Scott Davidson, and Christine Fearey on campus this year. Carol MacKinnon Fox let me know that she is still living in New York, where she just hit her 20-year milestone at Thomson Reuters. She leads the business unit that sells software and content to global accounting firms. She spends as much time as possible up in the Adirondacks with her partner, Phil, a writer she met on the top of a snowy mountain in Saranac Lake in 2014. The poem is inscribed on a bench to remember the Form of ’88. Jael may have danced once or twice, hard to tell for sure. Looked like a beautiful and fun event. The Form of 1989 was well represented in a meeting in Denver this summer (l. to r.) back: Andrea Greer, Andrew Balser, Amy Beattie and David Kolojay; front: Laura Lepler Munro, Dave Letuhold, and Kate Gellert. Summer is the time for traveling across the country and reconnecting with friends and Denver was the site of a Form of ’89 mini-reunion. When the Colorado faction learned that Andrew Balser would once again be traveling through the state to bring his daughter to summer camp, Amy Beattie took up the charge to organize an SPS night out. Amy rallied Andrea Greer to fly up from Texas and Kate Gellert to drive down from Vail to meet up with Andrew, his daughter, Dave Leuthold, David Kolojay and myself. The crew partook in a fabulous dinner and rumor has it there was even some impromptu singing by Andrea after an ice cream pit stop. Hopefully this great night out is foreshadow of the upcoming 30th reunion. John Lehmann has been splitting his time between Hamilton, Mont., and Lake Tahoe now that his kids have moved on to university and beyond. If anyone happens to be in either area, look him up. Andrea Greer and Amy Beatie had a rendezvous in New Hampshire in September, as Amy graciously agreeded to be Andrea’s co-pilot as she brought her parents’ car and dog back to Texas from their lake house. The two took photos at all the historic sites along the way for everyone’s amusement and entertainment. They wished they had time to stop and visit folks along the way, but they were cannonball running it to get Amy back to Denver in time for important political shenanigans. Lily Rutherfurd Kinlin checked in as she and her family were en route to SPS in September to drop off Charlotte ’22 and Frank ’21.